Birthplace : Butte, Montana, U.S.
Evel Knievel , born Robert Craig Knievel, was an American daredevil and entertainer. In his career he attempted over 75 ramp-to-ramp motorcycle jumps between 1965 and 1980, and in 1974, a failed jump across Snake River Canyon in the Skycycle X-2, a steam-powered rocket. The 433 broken bones he suffered during his career earned an entry in the Guinness Book of World Records as the survivor of "most bones broken in a lifetime." Raised by his grandparents in Butte, a copper-mining town, he began doing motorcycle stunts as a teenager. He embarked on an incredibly varied career (1956–65) that included professional hockey, a stint in the U.S. Army, work in the copper mines, and eventually crime - safecracking and holdups. He ‘went straight’ in 1965 and formed a troupe called Evel Knievel's Motorcycle Devils. He rode through fire walls and jumped over live rattlesnakes. Evel Knievel steadily increased the length and danger of the jumps until, on New Year's Eve 1967 he was nearly killed when he jumped the fountains in front of Caesar's Palace in Las Vegas. The crash landing put him in the hospital in a coma for 29 days. Knievel’s many dangerous and thrilling stunts, including jumps over Greyhound buses, live sharks and Idaho's Snake River Canyon, made him an international icon in the 1970s. Immortalized in the Washington's Smithsonian Institution as "America's Legendary Daredevil," Knievel suffered nearly 40 broken bones before he retired in 1980. Knievel married hometown girlfriend, Linda Joan Bork, in 1959. They separated in the early 1990s. They had four children, Kelly, Robbie, Tracey and Alicia. After Evel retired, he managed Robbie's stunt career. Knievel married his longtime partner, Krystal Kennedy-Knievel in 1999. They divorced a few years later but remained together. Knievel had 10 grandchildren and a great-grandchild. Knievel had undergone a liver transplant in 1999 after nearly dying of hepatitis C, likely contracted through a blood transfusion after one of his bone-shattering spills. Motorcycle daredevil Evel Knievel who defied death for decades died on November 30, 2007 in Clearwater, Florida. He had been in failing health for years, suffering from diabetes and an incurable condition that scarred his lungs. His death came just two days after it was announced that he and rapper Kanye West had settled a federal lawsuit over the use of Knievel's trademarked image in a popular West music video. Knievel died of pulmonary disease in Clearwater, Florida, aged 69. According to The Times writing his obituary, Knievel was one of the greatest American icons of the 1970s. Knievel was inducted into the Motorcycle Hall of Fame in 1999. 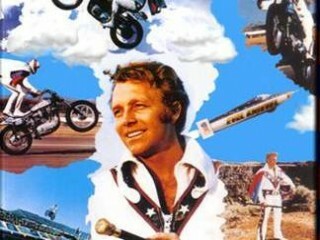 View the full website biography of Evel Knievel.